How YOU can save the world! Yesterday we heard the heartbreaking news that restricting climate change to 2.0 degrees, which we weren’t on track to achieve anyway, won’t be good enough to prevent the worst damage. I wrote an article delving into the details. Here is something more positive: a guide to what YOU can do about climate change, starting right now. Some of the things are really easy! The short-version is: go vegan, get a veg box, be really rude to people to by air-freighted food, drive less, walk more, switch to good energy, wear jumpers and insulate stuff. All of these things are good for your health and for the health of other people too! Kaboom! Go vegan, vegan-ish or reduce your consumption of animal products. How? Start here. Why? Also see this in the Guardian and remember – your pets can go vegan too! However, if you buy from Riverford – who we love – then 72% of your veg will be from the UK. Things only come from further-afield if it’s more efficient (e.g. early/late Tomatoes) or if they don’t grow here (e.g. Oranges and Bananas). For those who are really determined for 10/12 months of the year they also do an amazing 100% UK veg box. Also, check out this food miles calculator – might be a fun project for kids on a rainy weekend! It just needs to become socially unacceptable to buy air freighted food. Have a go at your friends when they do it. Make a complaint at the supermarket. Be rude, pass it on! Air pollution exposure kills – it kills thousands every year in the UK. 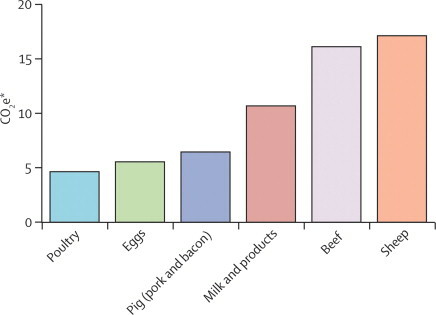 According to the Lancet  In the EU there were 2002 years of life lost in 2010, per million people. So in one year, people living in the UK lost 132,132 years off their collective lives because of pollution, through heart and lung disease and cancers. Transport, in the UK, is now the most polluting thing we do in terms of greenhouse gas, accounting for 26% of all our emissions. These emissions must fall by 44 per cent before 2030, and that’s just to keep the UK on track to meet the 2% goal which has just been thrown out the window! Get a veg box – home delivery is more efficient than driving to the shops. We can personally recommend Good Energy. Seriously. They are fab. 100% of their electricity comes from sun, wind and wave. How ever much you use – they pump at least the equivalent into the national grid from a renewable source. They have always been cheaper – we have checked on switching sites several times over the years. Their prices have risen less often too (because the renewables market is more stable than oil). That and local UK based customer support, and nice yellow coloured electricity bills – what’s not to like! Good energy own 7 Solar farms and 2 wind farms, and also buy energy from small scale independent renewable projects. Their gas is eco-ish too, 6% of it comes from biomethane, that’s gas produced in the UK from organic matter like manure and sewage. The rest is offset by through verified carbon-reduction schemes that support communities in Malawi, Vietnam and Nepal. First of all, check out these grants for making your house more eco-friendly. This means, warmer, cheaper to heat, more valuable to sell and often safer. Try, as a mindful mantra, to put on a jumper when you are cold, rather than turning up the heating right away. A good jumper will save you money and make you feel all…. snugly! Insulation can be anything and everything from doing your loft space (we really like this insulation product btw) to putting some cheap insulation widgets around your hot water pipes or getting some thicker curtains. We are currently saving up to get genius hub – heat genius installed. You can have a thermostat in every room and automatic controls on every radiator. This means you can heat certain rooms at specific times of day, but not others. You can control it all from your phone too! I think it’s perfect for people who work from home. However, if you tend to either heat the whole house or not at all (for example If you work 9-5 and have kids etc too) then a simpler solution might be just as good, and cheaper. If you are faced with a boiler replacement situation, please consider an electric combi-boiler rather than gas. They are a little more expensive to run – but only because gas is currently cheaper than electricity. They are much more efficient, cheaper to install and safer to use. If you have solar panels, then it’s a really great combination. Hiya Anna and Joey. We have always used Ecotricity as they are 100% electricity and gas and build own wind turbines etc. Why is good energy better? Only wondering as always looking to find something better. Thanks lovelies. Hope you both ok.
Well, back in the day when we first bought electricity for ourselves, Ecotricity weren’t 100% renewable and good energy were, so that’s why we chose them. 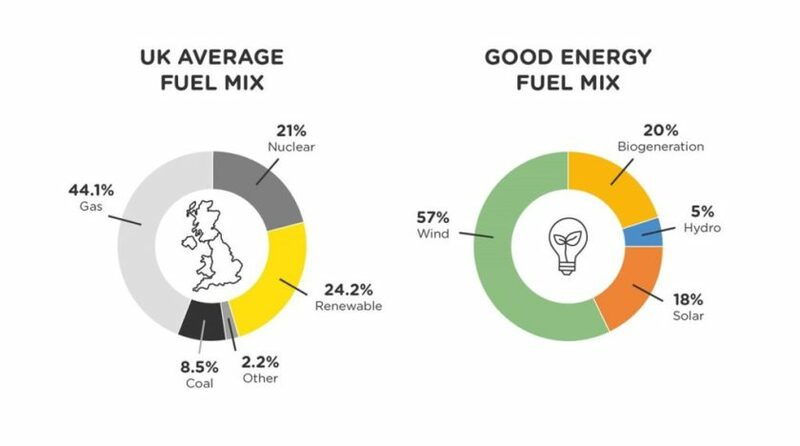 Ecotricity had a focus on buying from non-renewable sources and investing the profits in their own windfarms but Good Energy at first just purchased renewable energy from others and made less money. Now they both own a lot of renewable infrastructure themselves. We looked at switching to them a few times over the years by Ecotricity were always more expensive. Zoom forward to now, there probably isn’t much difference environmentally, but I think Good Energy are a smaller company and owned by a group of people and customer share holders (including the guy who owns ecotricity) where as ecotricity is owned by one person. I don’t much like the guy who runs ecotricity on a personal level, his ex-partner struggled to get any money out of him to raise the child they had together. However, the one downside of Good Energy is they don’t do things like smart meters yet, which is frustrating. Previous Previous post: Global Warming: what’s the difference between 1.5 and 2 degrees?